The blossoms of flowering branches will not open well at temperatures less than 72 degrees. Upon receiving your flowering branches cut the stems immediately and place them in warm preservative water. 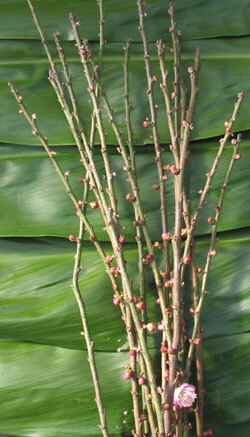 Leave the flowering branches in a warm area. The recommended temperature is 72 to 75 degrees. After the buds begin to open move the flowering branches to the cooler.